Your automatic quantities of these products will ship unless you specify changes by April 30th, 2019. Click here to customize online. You can also click here to download a printable form. 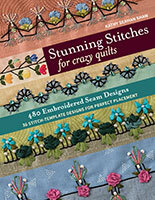 Get 480 ideas for crazy-quilt seams. Achieve uniform spacing with five pages of full-size stitch templates and dozens of step-by-step illustrations. Preserve family memories with new quilts that join the past and present. 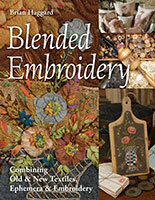 Make vintage hybrids, wall art, and sewing notions with gorgeous embroidery, old lace, new fabric, and more. See the evolution of one of today’s most important quilt artists. 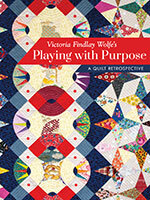 Victoria Findlay Wolfe’s body of work is shared in personal essays and photos of more than one hundred and thirty quilts. Sew a groovy messenger bag, wristlet, and key fob trio inspired by the 1970s! Create kraft-tex links with one of three methods, then finish the project on your sewing machine.